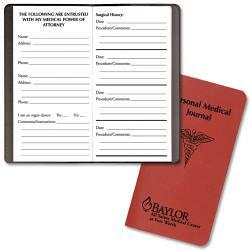 With your firm imprint or logo, our promotional personal medical journal, make great promotional items. See our wide choice of personal medical journal below. These items will make a big impression to promote your business by advertising with promotional products.. This means that everyone will see the personal medical journal with your company imprint or logo, use them, and think of your firm when they need your product or business. It is also a great way to promote a specific event. Description: 14 Pages. Features: • Health history • Hospital Listings • Physicians Listings • Current Prescriptions • Medical Power of Attorney • Insurance information • Religious affiliations • Surgical history Normal Production Time: 21 Working Days Product Size: 3-1/2" x 6-1/2"